Buying into a new-home community may seem riskier than purchasing a house in an established neighborhood, but any increase in home value depends upon the same factors: quality of the neighborhood, growth in the local housing market and the state of the overall economy. 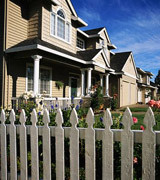 One survey by the National Association of Realtors shows that resale homes do have an edge over new homes. The trade group's figures show the median price of resale homes increased4.3 percent between 1999 and 2000, compared to 2.8 percent for new homes in the same period.